Is there any way to save camera photos DIRECTLY to Google Photos? ...and not have them save in the phone itself (in the "Gallery" app)? I have them all backed up to Google Photos and don't need them also on my phone. Would like to know. As it stands if you delete a photo anywhere is deletes everywhere. Just mass delete them after they sync. I get what you're saying though and it would be nice. Carousel for Dropbox does this. After the pictures are backed up it asks if you want to delete the originals from the device. Give it time, I wouldn't doubt they add this feature in a future update. That would delete the photos everywhere. Actually, no it wouldn't. I deleted all my photos off of my Samsung Galaxy S6 Edge and the photos are all still in Google Photos. Two separate things. That is correct. After back up I have deleted several from my phone but they are still on Google Photos. However if you delete a photo on Google Photos it will be deleted everywhere. I am not so sure that the second part is true. there is a Delete from Device option if you select the three dots in the upper right corner while in photo view. I see that I should have qualified my comment: if when logged on to Google Photos via a computer deleting a photo deletes it from all devices. As you note when in the Google Photos app on the phone, you have the option of deleting on phone only. No. If you delete the photo from you're phone or pc it won't delete from Photos backup app. If you delete from inside Google photos app, then it will only delete from the app, the pics will still be on whatever device you saved it to... In theory. No it won't, or shouldn't anyway. That's 2 way synching, Google Photos is a one way sync, I think. Someone please correct me if I'm wrong about that. That must be the pc version cause it's not showing device delete option on the phone app. Oh really? Interesting, and odd.... Guess I'll explorer it more cause mine does not show that option. Ok I think I figured it out. That pic you have in the screen shot is a pic you took with that phone and is actually on your phone in the gallery/camera so currently I bet. 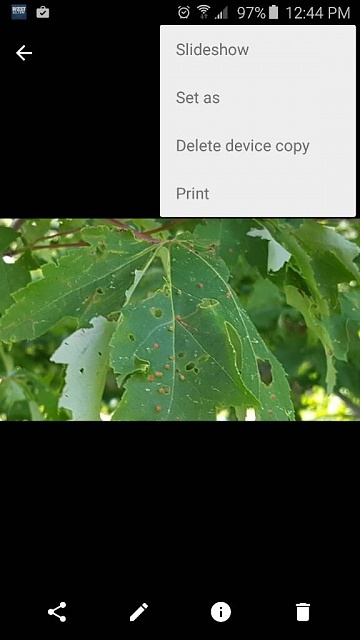 My pics that I took on this phone and that show in the device currently offer that delete on device option to. The pics that were taken on another camera/phone or downloaded do not offer that option. Ok this makes sense now. I was hoping for it to happen automatically. You can try changing the default photo app in your phone's setting. I haven't tried it yet but maybe it'll work? Are my photos lost forever? AT&T refusing to give me a nano Sim because I have a LG G4!!! Anybody Get Gear 2 to Work Without Rooting? How do I SHARE contacts between an S6 and S5?